The Department of Defense announced today the death of a soldier supporting Operation Iraqi Freedom. 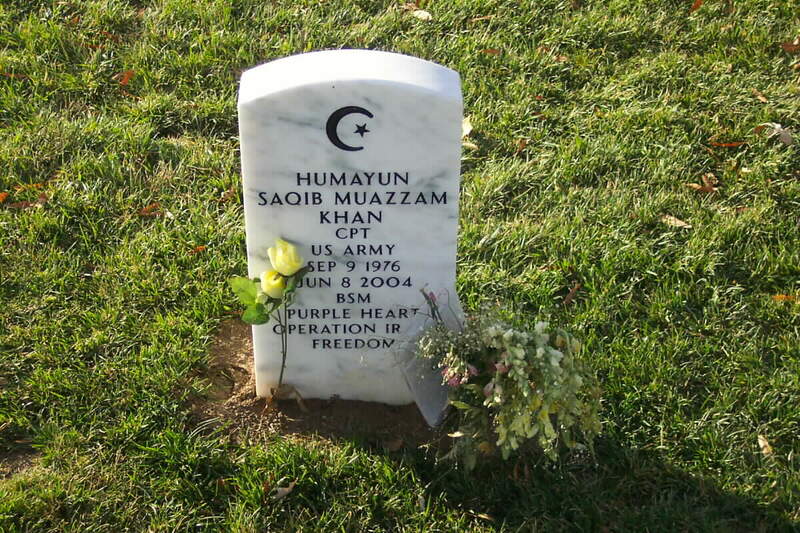 Captain Humayun S. M. Khan, 27, of Bristow, Virginia, died June 8, 2004, in Baquabah, Iraq, after a vehicle packed with an improvised explosive device drove into the gate of his compound while he was inspecting soldiers on guard duty. 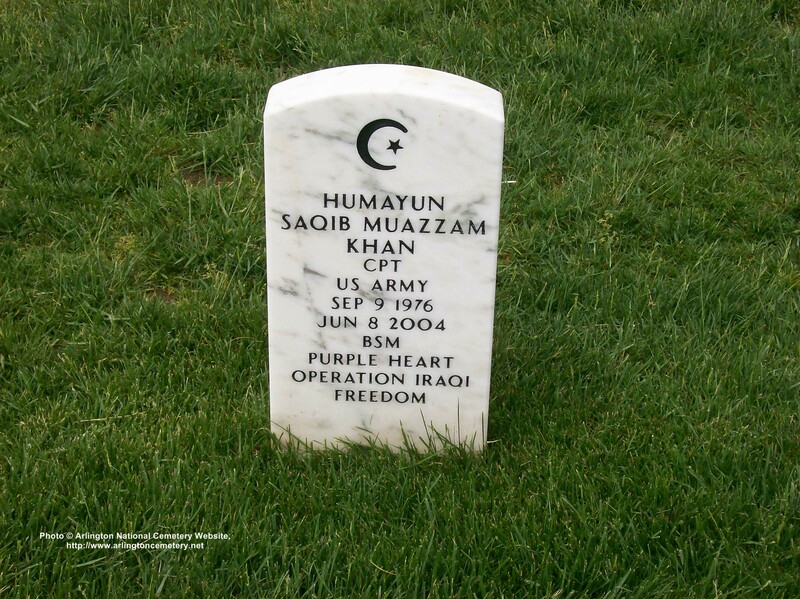 Khan was assigned to Headquarters, Headquarters Company, 201st Forward Support Battalion, 1st Infantry Division, Vilseck, Germany. DCM Mohammad Sadiq and interns from the Embassy of Pakistan Tuesday evening attended the funeral of Captain Humayun Saqib Khan held at the Arlington National Cemetery, says an Embassy press release. He was laid to rest with full military honors. Captain Khan was a Pakistani American who served in the U.S. army as an ordnance officer, being the senior-most community member to die in Iraq. His colleagues and superiors remembered him for his courage, honesty, sense of humor and grace while in the field, even under pressure. Captain Khan's colleagues eulogized his exemplary services and praised him for the leadership he provided to his troops. The Muslim chaplain who led the Nimaz-e-Janaza after the military honors, specifically highlighted the ethnically-diverse group that had come to pay its respects to Captain Khan. He was one amongst the growing number of Pakistani Americans in the U.S. Army. Army Captain Humayun Khan tried to reassure his parents in Prince William County, Maryland, that he was safe -- even though attacks on his base in Baquba, Iraq, were almost constant. "Whenever I talked to him, I started to cry," said his mother, Ghazala Khan, 52. "He always said to me, 'Don't worry. I'm safe.' "
The last time she spoke to her 27-year-old son was Mother's Day, May 9. Yesterday, under the hot midday sun, she and her husband, Khizr M. Khan, 53, watched as their middle son was laid to rest at Arlington National Cemetery. Khan's was the 66th casualty of the Iraq war to be buried on the cemetery's lush, manicured hills. His flag-draped wood coffin was placed at the end of a row of marble headstones. On June 8, Khan died in a suicide car bombing at the main gates of his base. Khan, an ordnance officer with the Germany-based 201st Forward Support Battalion, 1st Infantry Division, had watched as several of his soldiers prepared to do a routine vehicle inspection. His unit was charged with the day-to-day security and maintenance of the camp. When an orange-colored taxi drove toward them, Khan ordered his soldiers to "hit the dirt," said his father, who received details of his son's death from his commanding officer. Khan walked toward the car, motioning for it to stop, his father said. A makeshift bomb inside it exploded, killing him and two Iraqi civilians in addition to the two suicide bombers. Ten soldiers and six Iraqi citizens were also wounded, the Army said. Khan's father said he is proud of his son's courage but is devastated by the loss. "Where did his strength come from to face such a danger instead of hiding behind a pole or booth or something?" his father said. "Normally we would try to hide. Had he done that, there would be no problem at all. It may have not been fatal." Family members and friends -- including Khan's girlfriend, Irene Auer, 24, of Amberg, Germany -- have filled the Khans' Bristow home in the past week, weeping and praying for the Muslim soldier they will remember as helping to build a bridge between the American and Iraqi people. During his three months in Iraq, Khan helped put Iraqi civilians to work for $5 an hour patrolling the streets of Baquba under the U.S. Army, his father said. The program, dubbed the United States-Iraq Sponsorship Program, was intended to help combat high unemployment and provide the local population with security and peace, his father said. "He was always a peacemaker," Khizr Khan said, "always seeing an opportunity to give. He always said to the Iraqis, 'We're here not to hurt you but to help you.' "
Auer said her boyfriend enjoyed taking responsibility for others and always respected those around him. "Whenever I was upset, he always found the right words. He always calmed me down," she said. "He was perfect. He was the most wonderful person I've ever met." Khan had hoped one day to go to the University of Virginia law school, his father said. He wanted to be a military lawyer and joined up four years ago in part to pay for law school. His stint was up last month, but because of the Army's efforts to stem its manpower losses, he was assigned to Iraq indefinitely. Khan, who was born in the United Arab Emirates, moved to Silver Spring at age 2. He graduated from Kennedy High School in 1996 and the University of Virginia in 2000. Yesterday, he received full military honors. Lieutenant Colonel Kenneth Kerr, an Army chaplain, read a letter written by Khan's commanding officer, Lieutenant Colonel Dan Mitchell. "He died selflessly and courageously, tackling the enemy head on," Mitchell wrote. "We will not forget him and the noble ideas he stood for." 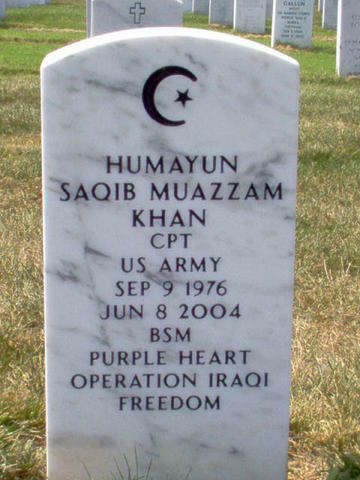 Khan was posthumously awarded a Bronze Star and a Purple Heart. 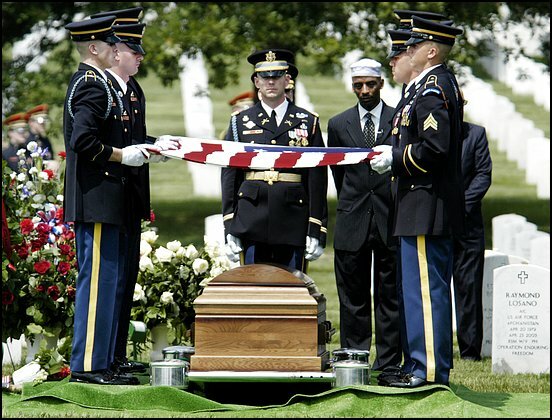 Sergeant First Class Robert J. Mogensen of Leesville, Louisiana, was also buried yesterday at Arlington. He was a member of the Army's Special Forces who was killed in Kandahar, Afghanistan, on May 29, 2004. His funeral was closed to the media, cemetery officials said.